Since the tender age of nine, Hayate Ayasaki has busted his behind at various part-time jobs to support his degenerate gambler parents. And how do they repay their son's selfless generosity? By selling his organs to the yakuza to cover their debts! But fate throws Hayate a bone...sort of. I originally created this thread because c_k told me too. Since then I began reading the series ever so slowly. It took me some time to get into the art but I'm use to the designs by now. Manglobe is a studio that puts time and effort into their anime but I haven't watched a single episode yet. Perhaps this summer I'll marathon more manga and the anime. 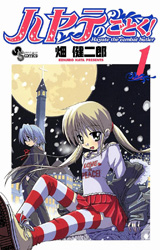 I'm surprised not many people are reading Hayate. I actually wrote about Nagi a while ago. I find her quite an interesting character. Who here thinks that Nagi should be the canon relationship for Hayate? Or should it be someone else? Nagi and Hayate will never end up together and here is why. Somewhere down the line Hayate will be blasted back in time where he will meet Nagi's mother and will ultimately become Nagi's mysterious, only seen in the background of a flashback, father. If not, then I vote harem ending! Uh, according to the latest chapter, Hayate is going on hiatus unitl FEBRUARY 29th. NYOOOOOOOOOOOOOO!!!!!!!!!!!!!! I just saw Heaven Is A Place On Earth and it was AWESOME!!! When Nagi and Kayura got separated at the ferris wheel. When Hina brought out Shirosakura! Another thing I liked about it was becuase it was spoiler-rific. It movie came out in theaters before Kayura had even been introduced in the manga and right after the opening theme we learn what Wataru's new business is. What I'd like to know though is, if this movie is canon and I think it is, just who was that white-haired woman. New Anime will air within a month. Yay. Recently in the manga, we finally caught a glimpse of Himekami, an enigmatic character who has only ever been mentioned since the first fricken volume. 376 chapters and we're only just starting to get into it. Tally hoooooo! I can't believe this thread isn't longer Hayate is such a great manga. Don't do it Klaus! The evil nun is ripping you off! And boom! A sudden serious turn of events for Ruka. The idol steals the butler's "virgin" lips. Recent chapter, Hayate seems close to detonating the time bomb with that last remark. Is the end nigh? I like Wataru, since he's one of the few male characters in this manga. I'll enjoy this upcoming Wataru centric chapter. And yes that is the reality of this manga. ...Mm. A monk? What's that hamster talking about? If "Heaven is a Place on Earth" and "Can't Take My Eyes Off You" are technically canonical, I wonder how Nagi is going to manage. Oh wow, this "Nagi's manga arc" has so far been lackluster, but now it looks like it's finally going somewhere. Okay, chapter 404, that was the laziest form of foreshadowing I've ever seen. So everything ends the day before their one year anniversary, splendid.